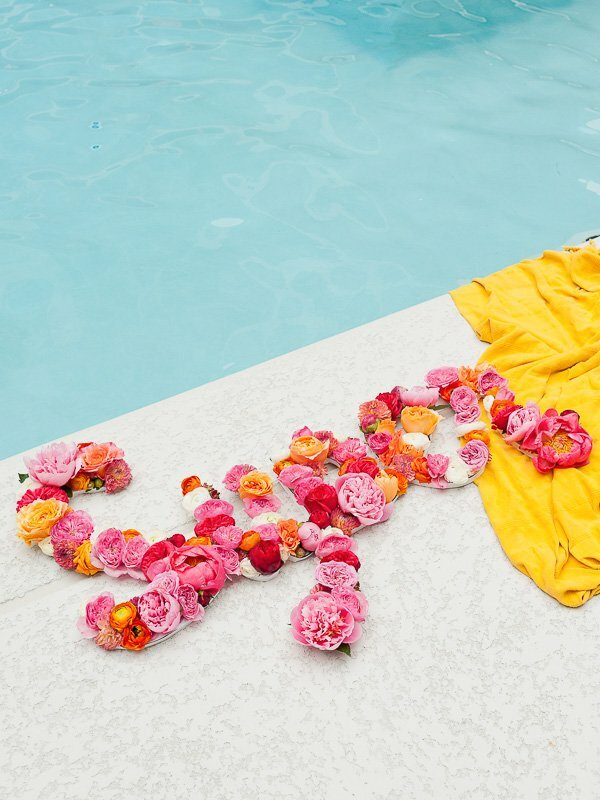 Ever since making this floating flower project in Palm Springs years ago, I’ve been dying to give it another try. 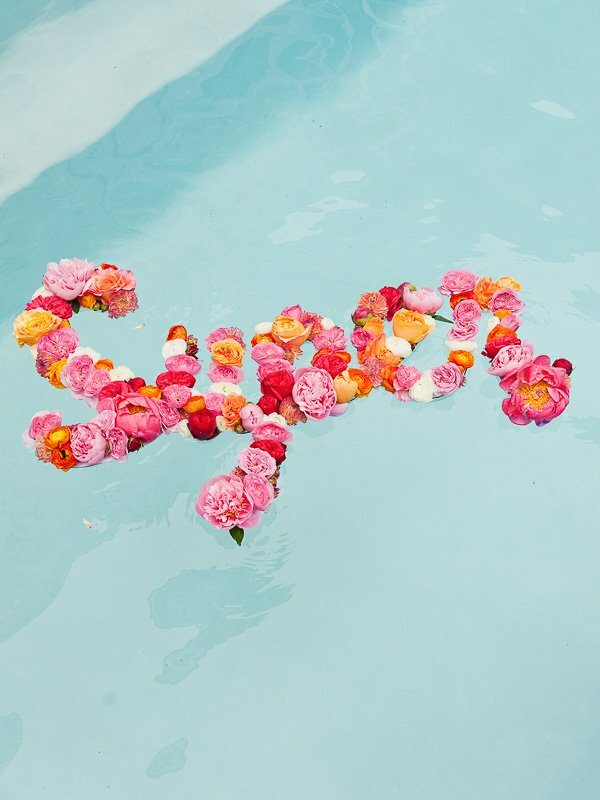 I wanted to make something that would be a unique addition to different kinds of summer events – pool parties, weddings, birthdays, etc. 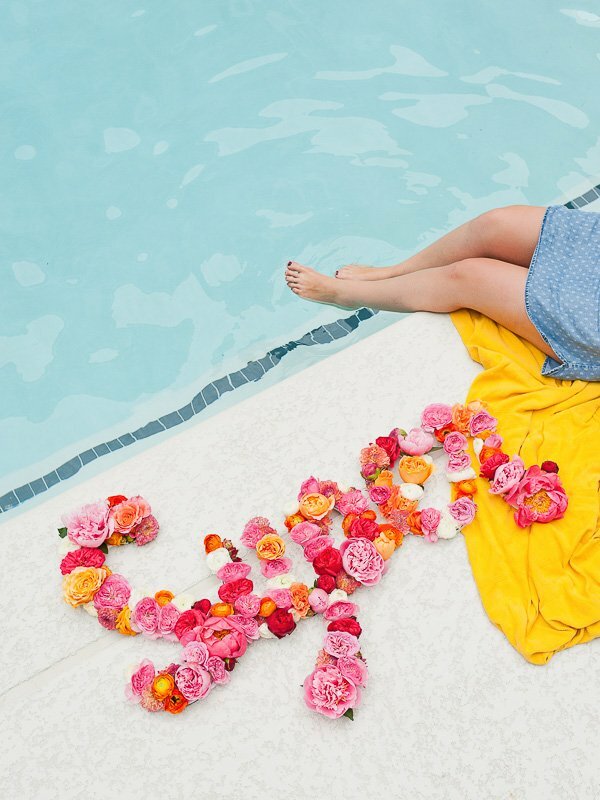 And I eventually landed on this floating flower DIY, that is currently making all of my summertime wishes come true. 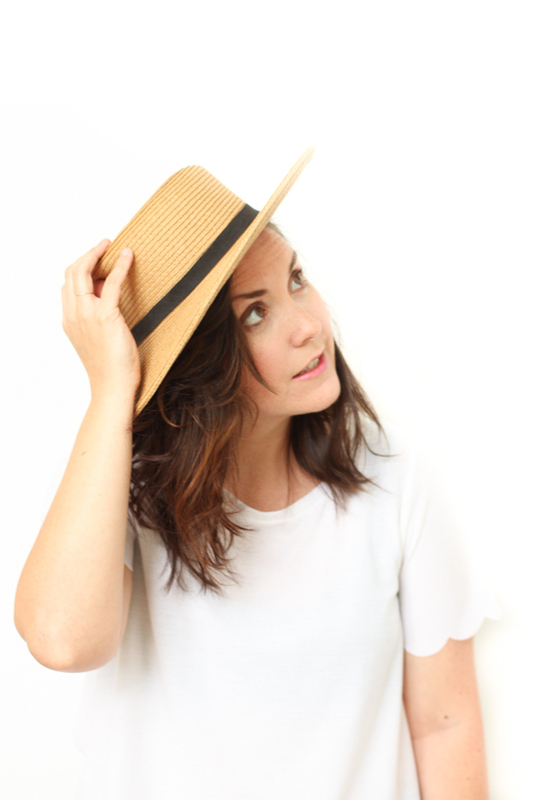 I teamed up with Fiskars to make it happen. And the end result is kind of SUPER. 🙂 Click through for the step by step instructions and a whole lot of obligatory pool shots. Much like the process I followed for the other floating flower DIY, I started with large sheets of foam board. This time around, there was a lot more measuring, hand lettering, etc. But it was pretty straightforward once I got started and is definitely something that you can recreate for your own event – with any word, phrase, etc. One of the big time savers for me was using the right materials to keep the process moving as quickly as possible. Things like super sharp blades for cutting the foam, the right gardening shears for trimming the stems, etc all helped to streamline the process. Fiskars makes a really great detail knife (Easy Change Detail Knife) for precisely cutting lots of different materials, which worked great for this project. And I really love their pruners as well (the PowerGear2 Pruner). As for the flowers, I’m not going to lie. You’re going to need a lot of flowers! I used fresh flowers from Flower Muse, who kindly donated the flowers for this project, but you can also use fake flowers if you want something that will never wilt. Fake flowers (in my opinion) won’t make as big of an impact as gorgeous fresh flowers will though. I mean look at those beauties. So, I strongly recommend going the real flower route on this one, if you can. 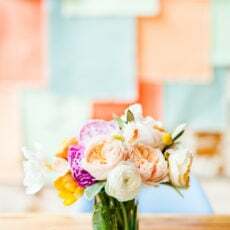 *I used a variety of flowers from Flower Muse (who I buy from regularly when we’re not working together on something – they ship really fast and their flowers are AMAZING). 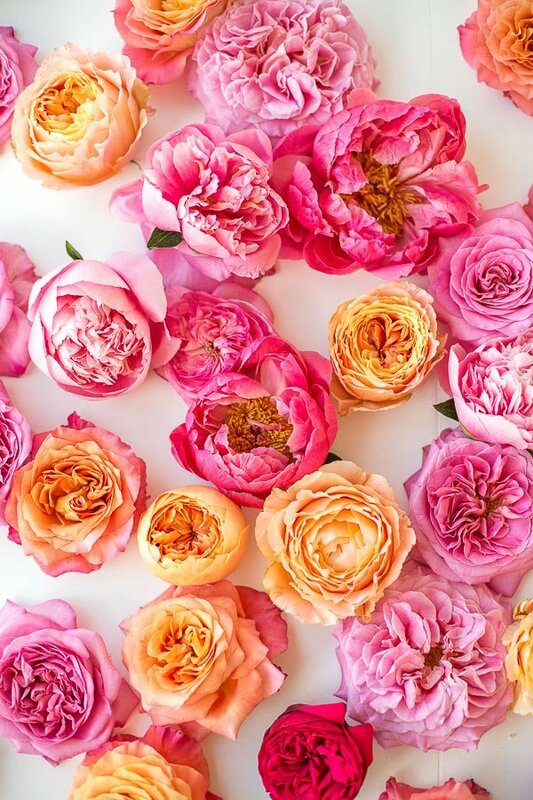 Here’s the list of all the flowers I used: ranunculus, coral peonies, pink salmon peonies, pink peach garden rose – free spirit, dusty pink garden rose – romantic antike, pink garden rose-mariatheresia , caraluna garden roses, red garden spray roses – piano, and pink peach dahlias. 1. First, decide what word or phrase you want to use. I would recommend coming up with short words or phrases and separating each word if you’re doing a phrase (meaning each word would be a separate piece of foam board). This will help with the floating. 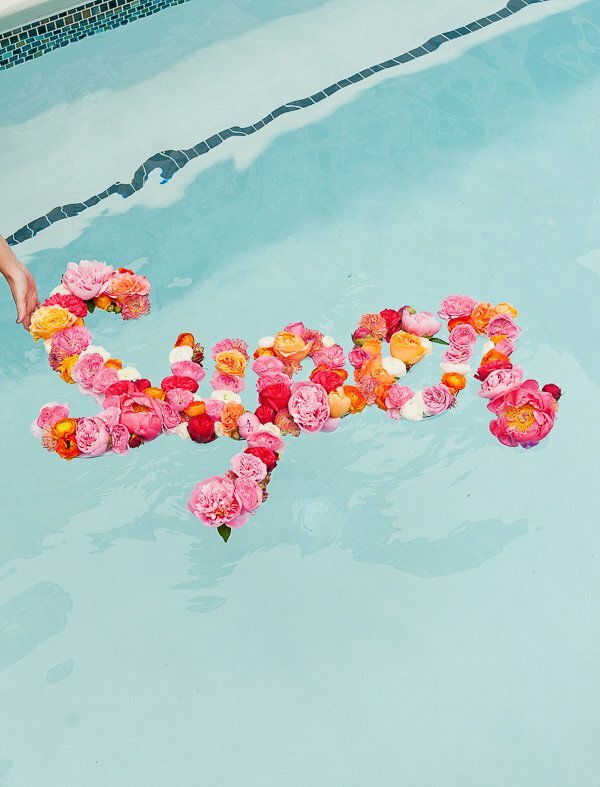 Here are some phrase suggestions: super duper (this was my original plan, but I ran out of flowers), vacay all day, make a splash. 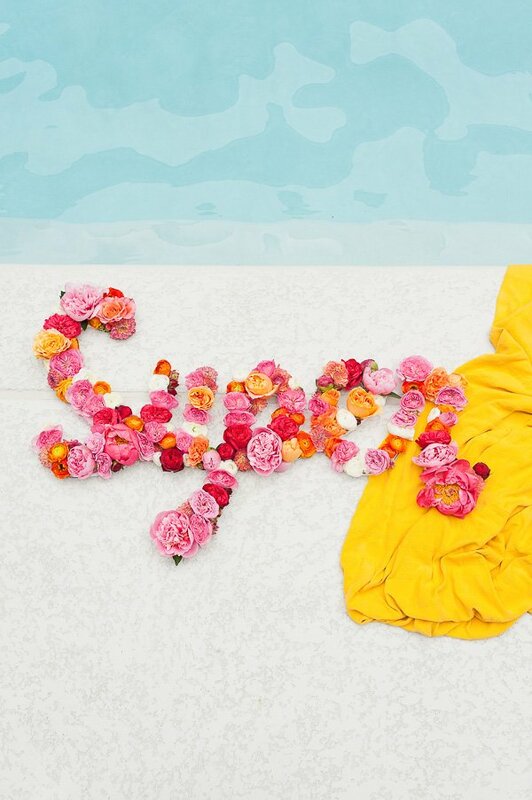 Writing someone’s name for a birthday party, a hashtag for an event, or a monogram for a wedding would all be good options for this type of project too. 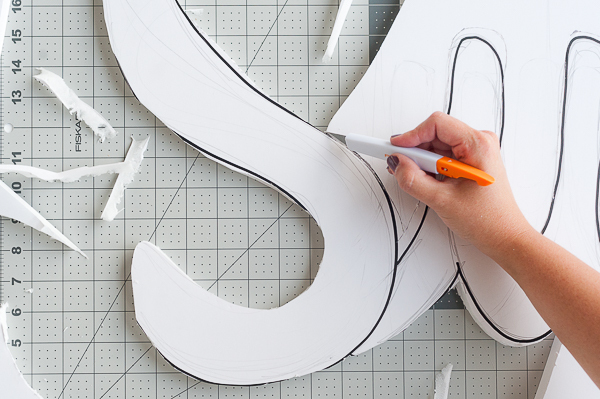 Then, you’ll officially start by taking some measurements to give yourself a good guide for the lettering. I used a piece of 30×40 foam board and my word had 5 letters. So I split the width of the foam board into 5 equal sections and then determine the height of each letter and mapped that out as well, with an acrylic ruler. This will really come in handy for step 2. 2. Once all the measurement guides are finished, you can write your word or phrase on the foam board. I used a pencil first and then went over the whole thing with a marker once I knew what I wanted it to look like. Note: When drawing out the letters, it’s important to remember that they need to have some width to them (similar to mine) to keep the flowers supported and have enough room for the flowers to be attached. I found that at least an inch wide in all areas worked well, with some areas being much thicker to give the word some personality and additional support. 3. Then it’s time to cut everything out, using a sharp blade and the marker lettering from step 2 as a guide. I used the Easy Change Detail Knife. It was very sharp, easy to hold, and the blades can be switched out quickly too when needed. Perf! 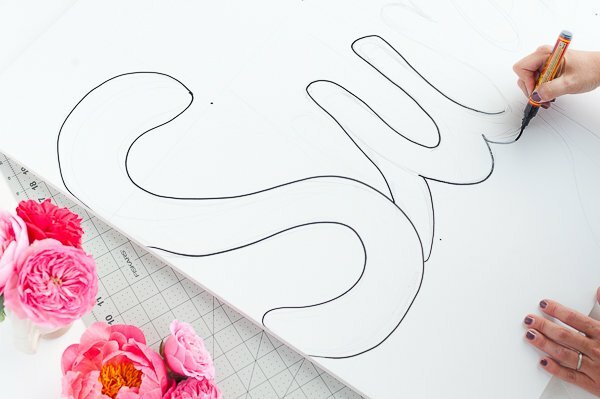 When cutting, try to use long, fluid strokes as much as possible to keep the edges smooth and professional looking. It also helps to cut large chunks off of the foam board edges from time to time, so that you can get as close to the sections that need to be cut as much as possible. 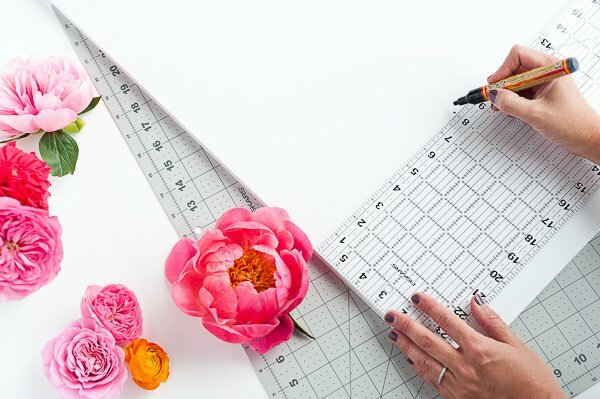 Using a cutting mat (mine is 24×36) will help with getting smooth lines as well because it provides a softer surface that will help you cut all the way through the foam board, without damaging whatever is underneath – like a table. 4. Once the word or phrase is entirely cut out, it’s flower time. 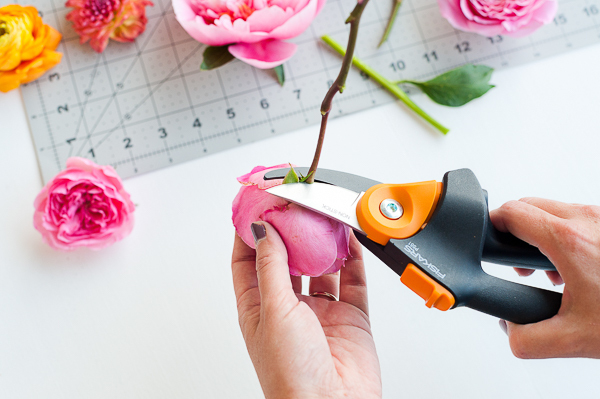 Cut the entire stem off a flower with PowerGear2 Pruners and glue it to the foam board with a hot glue gun. It helps to get as close to the base of the flower as possible to create a flat surface for glueing. 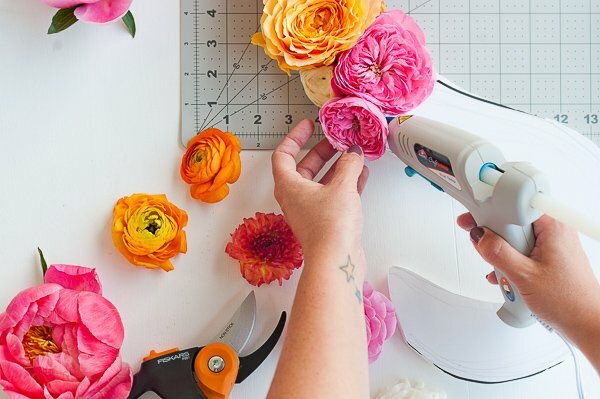 Repeat this process over and over again with varying flower sizes until the entire piece of foam board has been covered. Use small flower buds to fill in any small areas where the foam is showing through. Highly recommend the PowerGear2 Pruners btw. They’re honestly the best ones I’ve used. They have a lot of power, and the handles are really comfortable. Which means you won’t hurt your hands when you’re continuously cutting stems (and for this project, you will be). 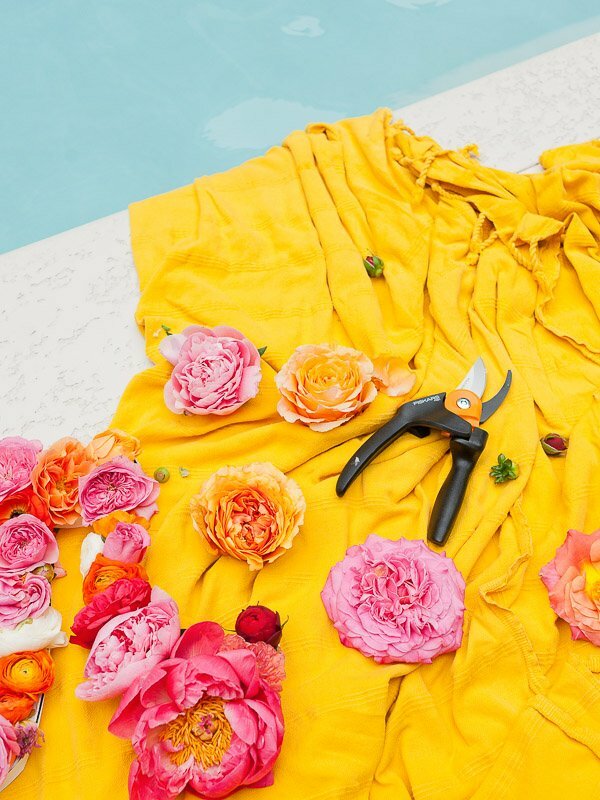 Once the foam is completely covered with flowers, it’s ready for the pool. Just set it in gently and you should be good to go. Note: The finished project (with all the flowers attached) will be fairly heavy. BUT it will still float, as long as you use foam board as your base, like mine. Do not use floral foam – it will sink. I tend to think that the thicker the foam board the better it will float for a longer period of time, because it will be slightly lifted from the water. So, keep that in mind when buying foam board for this project. The 1/2 inch thick board that I used worked great. If you keep each word relatively short (like 7 letters max for each word) and the piece is uninterrupted in the water (i.e. people aren’t jumping on it or splashing it too much), it should float for 4-6 hours or longer. So, it’s perfect for an event or party. 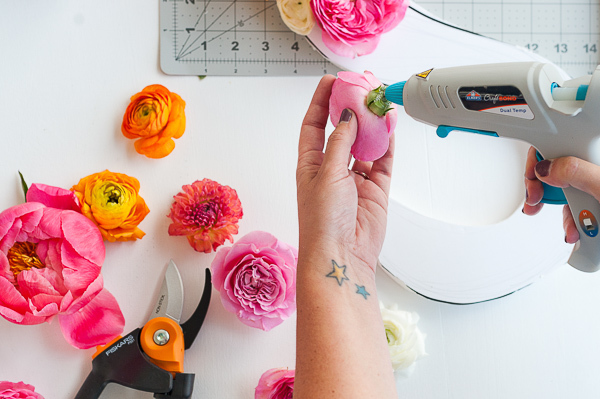 Once the party is over, you can actually remove the flowers from the foam board (the hot glue makes it easy to pop the flowers back off of the foam if desired). Put the blooms into shallow bowls of water and they’ll stay fresh for days longer, so you can keep enjoying them after the party is over. 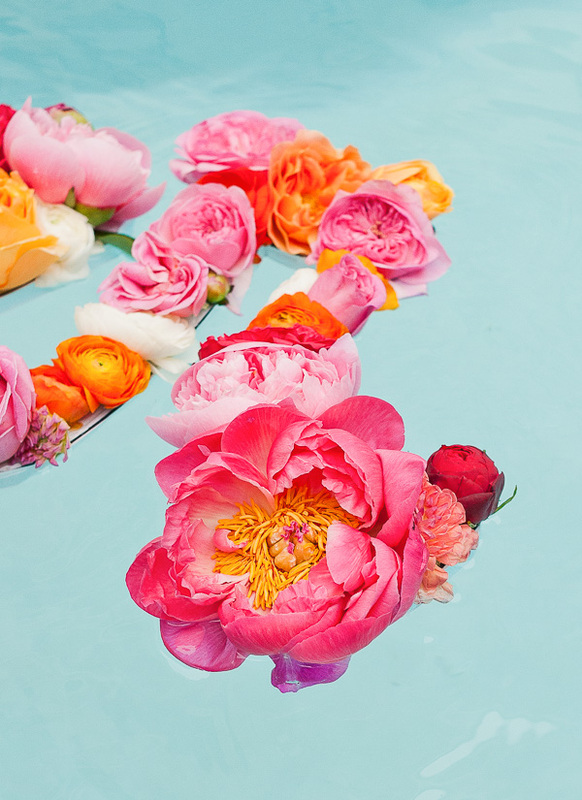 What do you think of this floating flower DIY? Would you ever try something like this? And what word or phrase would you create if so? 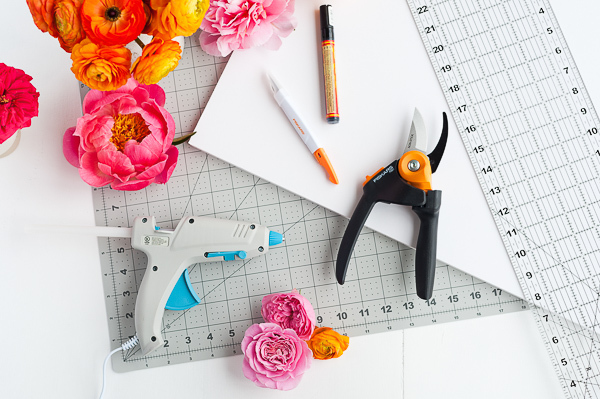 For more information on Fiskars crafting products, including their Orange-handled Scissors (which will be celebrating their 50th Anniversary in October), check out their website or follow Fiskars on Facebook, Twitter, Instagram and Pinterest. 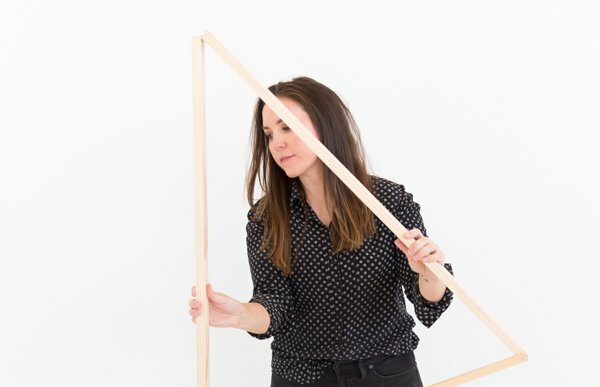 This post is in partnership with Fiskars. All opinions are my own. Thanks for supporting the brands that help keep Paper & Stitch running. This is so beautiful, what a shame that the flowers won’t last that long! Thanks Michelle. As I mentioned, you can use fake flowers instead if you want something that will last forever. 🙂 So, there’s options for everyone. This is so gorgeous! I love it! These literally could not be more beautiful!!!! I just keep pinning every single picture. Aw, thanks so much Lisa. I appreciate it! I love this DIY. It would make a great photo prop for a photo booth. Thanks Sophie! Yes, it would be a great photo prop for sure. Beautiful flowers. I very love this DIY. That’s a great idea the floating flowers are amazing Great work !! !